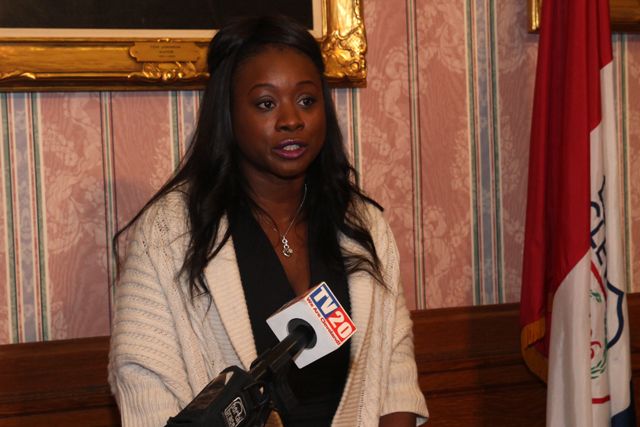 Today, Mayor Frank G. Jackson swore in three new members of the Cleveland Community Police Commission. 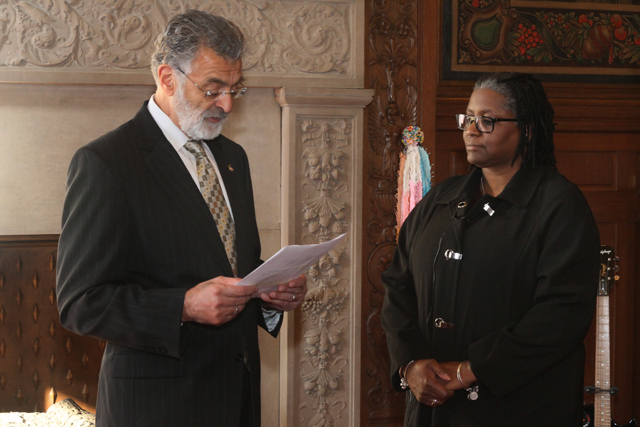 Mayor Jackson administered the Oath of Office to LaToya Logan, Gordon Friedman, and Police Sergeant Deirdre Jones at a ceremony in the Mayor’s Red Room. The new positions will fill previous vacancies left in the Community Police Commission. The mission of the Community Police Commission is to make recommendations on policies and practices related to community and problem-oriented policing, bias-free policing, and police transparency; to work with the many communities that make up Cleveland for the purpose of developing recommendations for police practices that reflect an understanding of the values and priorities of Cleveland residents; and to report to the City and community as a whole and to provide transparency on police department reforms. LaToya Logan. Ms. Logan is a seasoned social worker who specializes in trauma, criminal justice, and crisis management. She is currently a licensed independent social worker, certified clinical trauma professional with the International Association of Trauma Professionals, and a supervisor with the Counselor, Social Worker, Marriage and Family Therapist Board of Ohio. Ms. Logan has conducted training for community mental health agencies, mental health boards, and human service conferences. She is the founder and director of Project L.I.F.T., and has earned a bachelor’s degree in English education from Michigan State University and a master’s degree in Social Administration from Case Western Reserve University. Gordon Friedman. Mr. Friedman is a private practice attorney with Friedman and Gilbert, who specializes in Criminal and Civil Rights litigation. 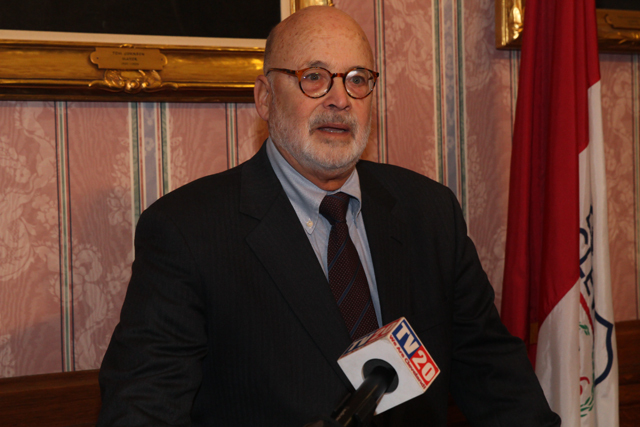 Mr. Freidman currently serves as the President of the Board of Trustees for the Free Medical Clinic of Greater Cleveland and as Commissioner for the Cuyahoga County Public Defender Commission. Mr. Friedman was an adjunct professor of law at Cleveland-Marshall College of Law for the past 40 years and his previous work includes time as the Executive Director of The Free Medical Clinic of Greater Cleveland and as a staff attorney for the Public Defender’s Office of the Cleveland Legal Aid Society. Mr. Friedman received his undergraduate degree from Miami University and his Juris Doctor from The George Washington University. Police Sergeant Deirdre Jones. Deirdre Jones is currently a Sergeant with the Cleveland Division of Police and is the Division’s first African-American female to supervise the Homicide Unit. SGT Jones is a state certified domestic violence instructor and a federally certified domestic violence instructor-trainer through the Department of Homeland Security. SGT Jones is a graduate of the Ohio Association of Chiefs of Police (OACP) Executive Leadership College and she has completed the International Association of Chiefs of Police and Federal Law Enforcement Training Center leadership programs. SGT Jones is a facilitator and coordinator of domestic violence-related workshops and discussion forums. She teaches local and national courses on domestic violence-related topics, and has advocated for the Division’s Domestic Violence Unit to be the primary investigator of Lesbian, Gay, Bi-sexual, and Transgender relationship violence. SGT Jones holds a Master of Public Administration from Villanova University and has been with the Division of Police for over 28 years.